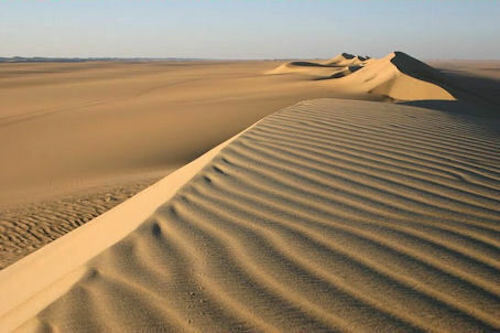 The Desert Fathers emerged in Egypt. Perhaps as early as the late 200’s AD, these Egyptian Christian men left the pagan cities, the persecutions and the distractions of life to live as hermits in the Sahara Desert. Their purpose was to live a solitary life solely dedicated to God. A wealthy, young Christian man, Anthony of Egypt (c. 251-356), gave away all his inherited riches and retired to a hut in the desert. 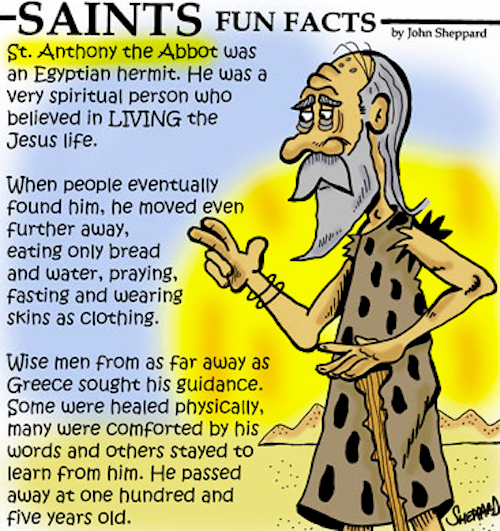 His very long and influential life as a hermit precipitated what has been called “the peopling of the desert.” After his biographer Bishop Athanasius (293-373) published his Vitae Antonii extolling Anthony’s life, flocks of Christian men and women came to Egypt to live the anchoritic life exemplified by St. Anthony. Soon the desert around Egypt’s major cities was filled with people living in individual cells they had built with their own hands. They wove baskets to sell, formed loose-knit communities and devoted themselves to labor, solitude and prayer. With the blood persecutions over in 313 with the Edict of Milan giving Christians the right to worship, some Christians began to embrace a “white martyrdom” in which the flesh was mortified so that the spirit might live. 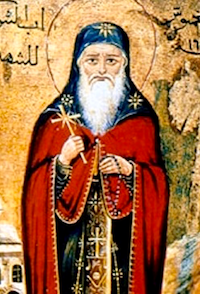 Another Egyptian from Thebes named Pachomius (292-348) was one of the founders of modern communal monastic life. 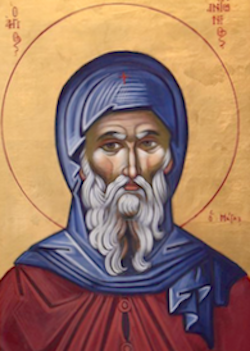 Pachomius felt drawn to the Desert Fathers and built his cell in the desert near St. Anthony. But Pachomius saw that most of the men who desired Anthony’s eremitic life could not live in such solitary isolation. He decided to build 10 to 12 room houses where men could live together in individual rooms and practice, if they so chose, certain mortifications of the flesh such as celibacy, obedience, poverty and/or self-sufficiency. 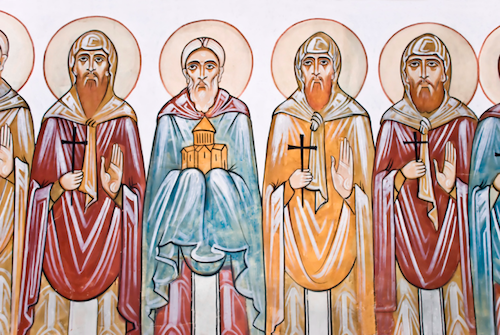 These early monasteries, and soon nunneries, had no Biblical mandates or foundations but were an outgrowth of the human desire to follow God without the normal daily distractions. Even though there had been monastic groups before Pachomius, he is called the “Father of Cenobitic Monasticism.” “Cenobitic” comes from the two Greek words koinos meaning “common, shared by many” and bios meaning “life.” Pachomius’ “communal living” was the opposite of Anthony’s solitary, hermitic life. 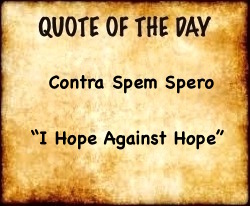 The genius was that he had combined the reclusive life of the individual cells with the communal life of corporate meals, work and worship. 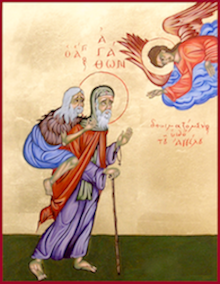 Pachomius remained monastic his whole life and refused to be ordained as a priest. 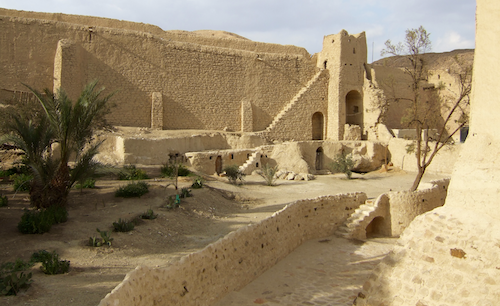 At his death on May 9, 348 more than 3,000 of his small “monasteries” dotted the Egyptian desert. 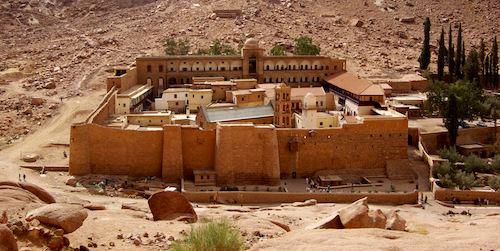 1,700 years later there are still 11 Christian monasteries (from the Greek monazein meaning “to live alone”) scattered throughout the Sahara Desert in Egypt. Outside of Cairo in Wadi Natroun (Coptic natroun meaning “salt” as in “valley of salt”) there are today four Coptic Orthodox monasteries that welcome visitors, Christian and Muslim. The cloistered life has always had an appeal for religious as well as philosophical people. 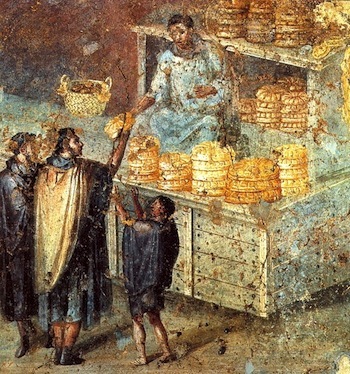 Even in the time of Jesus, the Jewish Essenes and another group called the Therapeutae were people who lived according to strict ascetic rules outside of society in the Judean desert.